Arriving on the pier at Toli-Toli was extremely hectic. Porters were running aboard shouting (to get passengers to move out of their way) to get to the goods or bags as fast as possible. Fortunately the port is small, and few people were getting on and off. After less than ten minutes I was on the road south through the streets of Toli-Toli. I didn't stop in town, but kept cycling out of curiosity about this island. It soon started raining, and I had to stop at a small shop. The shopkeeper sold me instant noodles, but not just dry ones in plastic wrappers. She actually made me soup, and charged the normal price for the noodles. Later, after a few kilometers cycling, the rain continued and it was getting dark. A man on a bicycle invited me to stay in his house. I accepted to camp on his veranda. 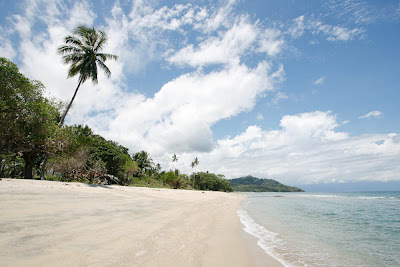 In the morning the weather was great again and I started an amazing journey south along the west coast of Central Sulawesi. After a steep climb over a little mountain pass I entered a beautiful landscape on a small but good enough road with hardly any traffic at all. The few vehicles I encountered were motorbikes, and the odd truck. The hills were covered in dense jungle, and the valley floor had tiny hamlets, rice paddies and sometimes a small football field and a church or mosque. Further on the road followed the shore, with beautiful white sand beaches, coral reefs just off the shore, small outrigger fishing boats in bright colors, coconut palms, kakao beans left out to dry, cows and buffalo in the middle of the road, and an ever present wildlife consisting of large and colorful butterflies, birds of prey, swiftlets and hornbills. In the hills there were monkeys, and lizards were basking in the sun along the side of the road in the morning. Every ten kilometers or so, there was a small village, with at least one hut selling basic stuff like coffee, sweets, instant noodles and fruit. The shopkeepers would offer to make noodle soup and coffee (add hot water and bring it out in a bowl and cup respectivly) for no or almost no extra cost. Neighbors, and all the kids in town, would come out to meet the strange white person. Kids and adults alike would shout a friendly "hello misterrrrr!" or just "hello! ", or just wave their hands as a greeting. The easy beach road cycling was repeatedly interrupted by steep climbs over jungle covered ridges reaching the sea from the mountains in the interior. If you have seen the opening scene of the movie A Thin Red Line, you know the feeling I got from riding through this area. It is simply paradise cycling. Yes, there is a 'but'. For the locals living here it may not be such a paradise. One guy was complaining about the poverty in these villages. It's not like they're starving or anything, but they are surly economically behind the big cities and the richer parts of Indonesia, not to mention the richer parts of Asia or the world. A few more tourists would not hurt at all (according to more than one person, I was the first westerner stopping in their villages - not only the first cyclist), and increased productivity in the local agriculture, and improved infrastructure, would make a big difference. Traveling from Tawau in Sabah (Malaysian Borneo) to Tarakan on the Indonesian side of the border involves a long boat trip, and a significant culture shock. In Tawau you're left alone, and most people act as if they have met westerners before and make not big fuss about it. In Tarakan on the other hand, the situation for a white foreigner is very different. As soon as you step onto the pier in the harbor, you are bombarded by cheerful and excited "Hello Mister! ", and questions about nationality, name, and what not. Few speak any English beyond the standard phrases or questions, and do not understand or care to try to understand an answer. I've been in the town for three days now, and only today did I meet the first westerner here - a French journalist writing about refugees in this border area. There is not much to do here except waiting for a boat to Borneo proper, or destinations further away, like Sulawesi, Java, or Papua. There are however some interesting thins to see. Forget about the "swimming beach" mentioned in a popular (and infamous) guidebook. It's a mud field on the shore, with a couple resturants. No sober and sane person would even consider going for a swim there. And calling it a good beach would be considered a bad joke. Then there are some old oil pumps around. They look like they should be in a museum, but still pumping up that black gold day and night. Tankers are filling it up at a pier to take it to Balikpapan or further. The best part of Tarakan is hidden behind the houses of the main street, and covers a large area all the way out to the proper waterfront. 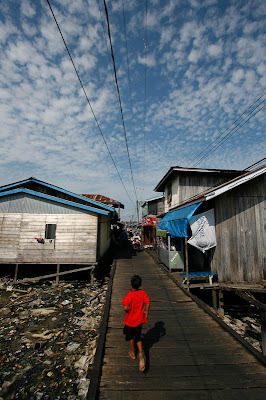 This part of town is flooded twice a day by the tide, and all houses are built on stilts in the mud. It's a poor part of town and it's all mad accessible by a maze of clunky wooden boardwalks and canals for small colorful boats. Motorbikes run up and down the narrow allies, and all the loose planks make an deafening noise. There is a whole town out here, with small shops, barbers, cell phone and outboard motor workshops, and mini wharfs. The rustic wooden houses are all covered with corrugated sheet metal. Some rustier than others. The boats are colorful, as are the lines of drying laundry and the people.